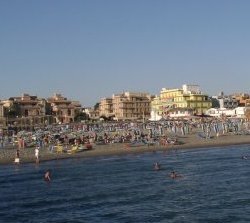 Ostia is the only city quarter that lies along the Tyrrhenian Sea. It is here where you'll find the Lido di Ostia beach favored by Romans. It is almost always crowded, especially during the weekends, with locals and tourists sunbathing and swimming. There are many seafood restaurants in the area. The beach also has provisions for mooring boats 8 to 60 meters long. Not too far from Rome?s historic centre, Lido di Ostia has its own archeological treasures, including an ancient port, Ostia Antica, believed to be second to Pompeii in importance among excavation sites in Italy. There is a large state-preserved pine forest here too, where the summer residence of the President is located.